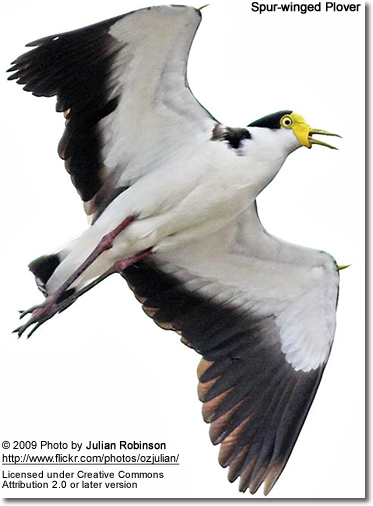 The Masked Lapwing (Vanellus miles), previously known as the Masked Plover or Plover, is a large, common and conspicuous bird native to Australia, particularly the northern and eastern parts of the continent. 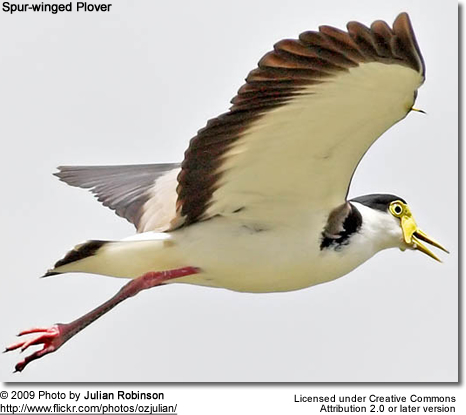 Vanellus miles novaehollandiae became self introduced to Southland, New Zealand in the 1930s and has now spread throughout New Zealand, where it is known as the Spur-winged Plover. It spends most of its time on the ground searching for food and has several distinctive calls. 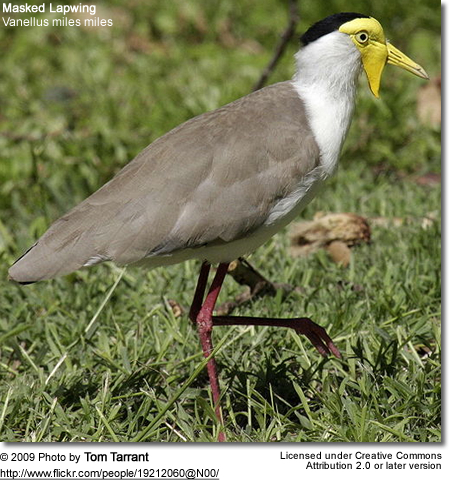 The Masked Lapwing of Northern Australia (Vanellus miles miles) has an all-white neck and large yellow wattles (loose folds of skin) with the male having a distinctive mask and larger wattles. 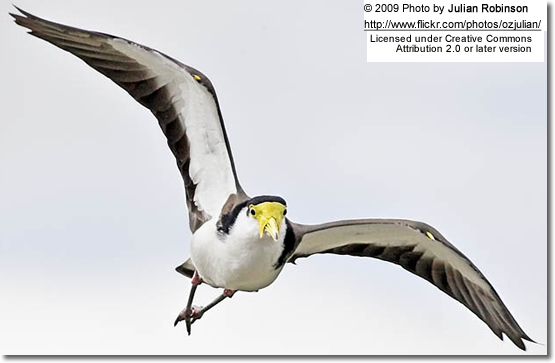 Masked Lapwings are a shy and harmless bird in summer and autumn but are best known for their bold nesting habits, being quite prepared to make a nest on almost any stretch of open ground, including suburban parks and gardens, school ovals, and even supermarket carparks and flat rooftops. 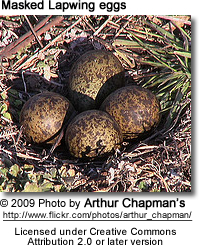 Breeding season usually happens after Winter Solstice (June 21), but sometimes before and the nesting pair then defends its territory against all intruders by calling loudly, spreading their wings, and then swooping fast and low, and where necessary striking at the interloper with their feet and attacking other animals on the ground with a conspicuous yellow spur on the carpal joint of the wing. There is a much-believed (but incorrect) myth that this spur can inject venom when used to strike an intruder. 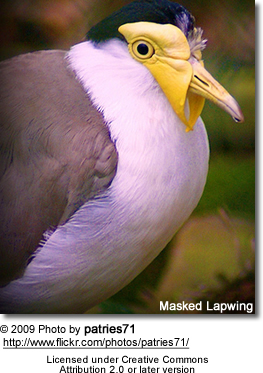 The myth may have been based on fear of the masked lapwing's territorial behavior. Attacks are most vicious on other birds such as Ravens, and also cats and dogs but once the chicks reach 60% in size after 2–3 months, the chances of this happening decrease. Strikes are much more rare on Humans since they are more aware. Sometimes the bird can damage its wing in a strike but usually survives and is flightless as the wing heals. 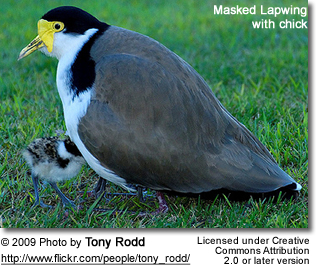 Some Masked Lapwings, especially some that live in residential suburban areas never breed due to increased dangers such as people on footpaths, cars. Nearly always two birds are seen together, a male and a female which are almost identical. Many also can be seen in groups at times, especially during feeding on coastlines. 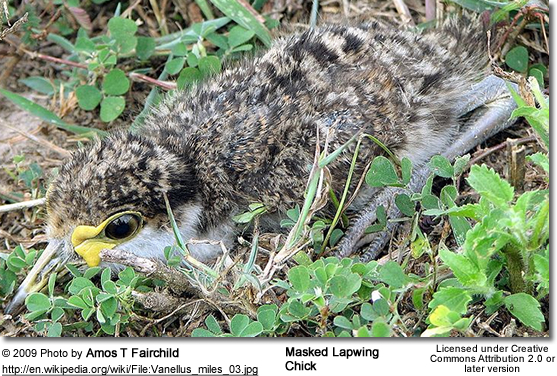 The chick reaches full height after 4 to 5 months and will often stay with the parents for 1 to 2 years resulting in groups of 3 to 5 birds over the summer months. 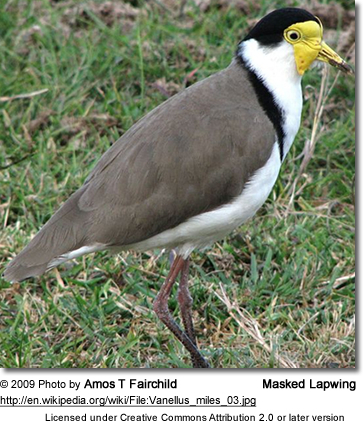 Masked Lapwings are most common around the edges of wetlands and in other moist, open environments, but are adaptable and can often be found in surprisingly arid areas. They can also be found on beaches and coastlines. The birds have a wide range of vocal calls which can be heard at any time of the day or night, such as the warning call, a loud defending call, courtship calls, calls to its young, and others. Since this bird lives on the ground it is always alert and even though it rests it never sleeps properly.